Even though mobile technology often simplifies the completion of everyday tasks, cell phone owners can also encounter technical glitches and unwanted intrusions on their phones. 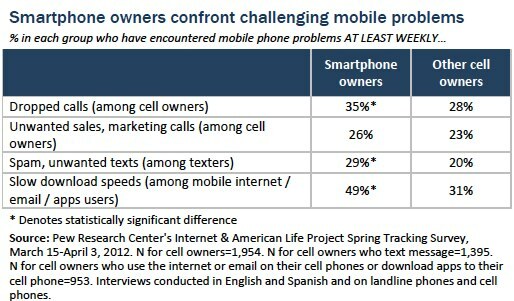 In an April 2012 survey, the Pew Research Center’s Internet & American Life Project assessed the prevalence of four problems that cell owners might face. 72% of cell owners experience dropped calls at least occasionally. Some 32% of cell owners say they encounter this problem at least a few times a week or more frequently than that. 77% of cell internet users say they experience slow download speeds that prevent things from loading as quickly as they would like. Of those cell internet users, 46% face slow download speeds weekly or more frequently. 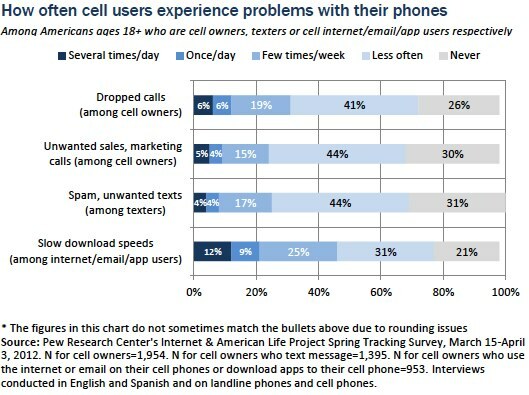 Smartphone owners reported higher incidence levels of these problems, compared with other cell owners, as shown in the table below. For instance, more than half of Hispanic cell internet users (53%) face slow download times at least weekly or more often, compared with 44% of white cell internet users who report this problem. 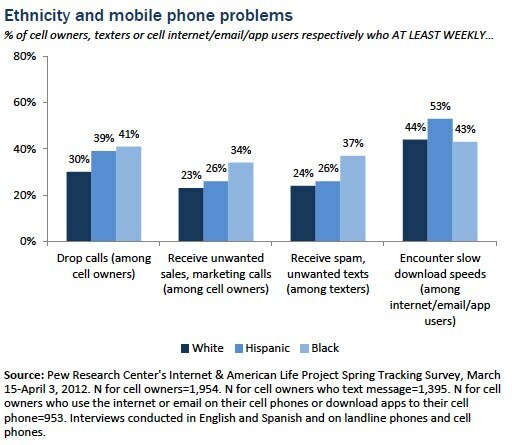 Some 41% of black and 39% of Hispanic cell owners reported dropping calls at least weekly, compared with 30% of white cell owners.